You are currently browsing articles tagged screening. 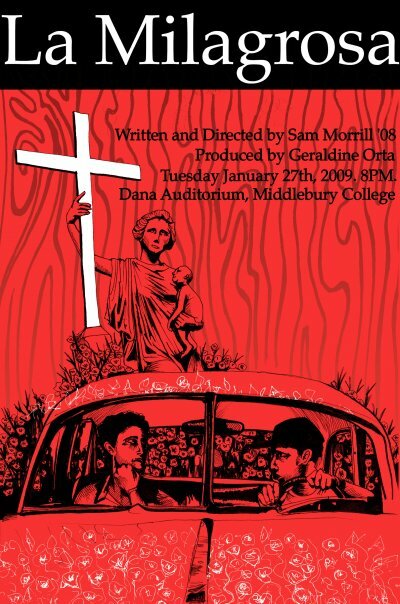 FMMC’s Digital Media Intern Sam Morrill has written and directed a film, La Milagrosa, which will be screened in Dana Auditorium, 8 pm on Tuesday Jan. 27th. We hope to see many of you there! Taking Root: The Vision of Wangari Maathai, a new film by Lisa Merton and Alan Dater, tells the inspiring story of the Green Belt Movement of Kenya and its unstoppable founder, Wangari Maathai, who, in 2004, became the first environmentalist and first African woman to win the Nobel Peace Prize. Taking Root illustrates the development of Maathai’s holistic worldview and model for sustainable development. Maathai discovered the core of her life’s work when she turned her attention to the rural women with whom she had grown up in Kenya’s central highlands. Their daily lives had become intolerable: they were walking exhaustive distances for firewood, clean water was scarce, the soil was eroding, and their children were suffering from malnutrition. One hundred years of colonialism and neo- colonialism had devastated the forests they’d lived with for centuries. “Why not plant trees?” Maathai thought. Trees provide shade, prevent soil erosion, supply firewood, building materials, and produce nutritious fruit. With this realization Maathai founded the Green Belt Movement, a grassroots organization encouraging rural women and families to plant trees in community groups. As the trees and the Green Belt Movement grew, a spirit of hope and confidence also grew in ordinary citizens – especially amongst rural women – only to be met with violent opposition from the government of Daniel arap Moi. Maathai and her colleagues soon bore the brunt of President Moi’s political oppression. In response, Maathai’s political activism only grew. At great risk she lead numerous confrontations in defense of the environment and social justice, all of which brought her country closer to democracy. Through TV footage, newspaper headlines, and chilling first person accounts, TAKING ROOT documents these dramatic confrontations of the 1980s and 1990s and captures Maathai’s infectious determination and unwavering courage. More info available on the film’s website. In 1802, the young Alexander von Humboldt led a scientific expedition to the Chimborazo in Ecuador, thought to be the highest mountain in the world and never before climbed. At great risk to his own life, as well as those of his companions – the French doctor and botanist, Aimé Bonpland, and the local créole aristocrat, Carlos Montúfar – Humboldt carefully measures and documents flora, fauna, soil, rocks, water, and the air itself. They survive snow, cold, and the thin mountain air and explore regions that no European had seen before. But it is his encounters with the indigenous people of Ecuador that deeply fascinate him. He explores their culture and language and comes to see German society in a new light. Partly filmed on location in Ecuador. Director, documentarian and writer Rainer Simon worked for the East German DEFA Film Studio from 1965 to the fall of the Berlin Wall in 1989. He made his directing debut in 1968 with a children’s film How to Marry a King. His film The Woman and the Stranger won the Golden Bear Award at the Berlin Film Festival in 1984. Much of his recent work focuses on the life and culture of the indigenous people of Ecuador. Simon will discuss his film after the screening. Sponsored by the Rohatyn Center for International Affairs, the Department of German, the Department of Spanish and Portuguese, and the Department of Film and Media Culture.